Jim Fletcher has worked with Richard Maxwell and the New York City Players for more than twelve years, most recently in Early Plays, a joint production with the Wooster Group. He is a member of the cast of Gatz, the Elevator Repair Service production based on The Great Gatsby, and has worked with Bernadette Corporation, Claire Fontaine, the English group Forced Entertainment (Sight is the Sense That Dying People Tend to Lose First, Quizoola! ), and Sarah Michelson (Devotion). In 2012, he received an Obie award for sustained excellence of performance. On October 20, Triple Canopy hosted Automatic Reading, a seminar addressing the act of reading as a part of contemporary artistic practice. 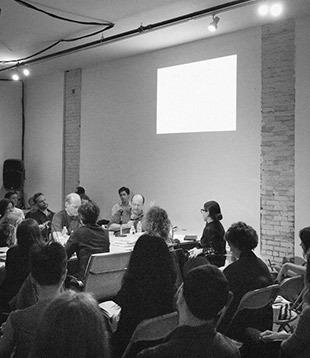 Here we present a recording of the seminar, in which Erica Baum, Franklin Bruno, Corina Copp, Jim Fletcher, Ariana Reines, Mónica de la Torre, and R. H. Quaytman discuss of how the legacy of conceptualism has challenged traditional notions of reading both as an exchange between an individual and a text and as a public activation of the written word. Automatic Reading is part two of Corrected Slogans (A Publication in Four Acts), Triple Canopy’s ongoing collaboration with the Museum of Contemporary Art Denver, in conjunction with the exhibition "Postscript: Writing after Conceptual Art". The first act of Corrected Slogans—Triple Canopy’s September 15th symposium, Poems for America—emphasized strategies of unoriginal writing and art making. Automatic Reading extends this line of inquiry by focusing on how conceptual practices make use of conventions of reading.